THE Maydena swimming pool will remain closed for a second summer after two safety audits returned unsatisfactory results. 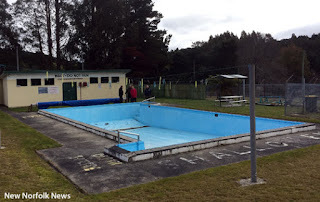 Maydena Community Association acting president Tim Parkes said the group, as the owner of the pool, had voted unanimously to close the pool at its meeting on Monday night. "It is a sad duty to have to report to residents that the pool will not be opening this year or any time in the near future," Mr Parkes said. "We have had two separate safety audits done, sponsored by Derwent Valley Council, from the Royal Life Saving Society of Australia and JMG Engineering and Planning from which we received a safety rating of 15 per cent," he said. Mr Parkes said the association would need to spend about $20,000 to meet basic requirements. "A further large allocation of funds would be required to meet the full compliance costs, money which we do not have," he said. "There are some 87 safety notifications in the audit which we are required to meet. Even if we had the money and could afford compliance this year, there is no guarantee that we could meet costs in the future. Swimming pools are extremely expensive to run, and it has become evident as the years pass that meeting rising costs is beyond our resources." Mr Parkes said only a small number of people used the pool and it would never be financially viable on that basis. "It is unfortunate that the pool has to close. We know the children particularly are going to be disappointed, but we just do not have a choice." A copy of the two safety audits will be available for inspection at the Maydena post office and the community association is looking for alternative activities for the town's young people, such as possibly providing a free bus to another swimming pool.